The 2nd annual SXCHI Music Festival takes place March 16-19 at the Trophy Room in Austin, TX. Check out the lineup of over 40 of Chicago’s best musicians after the jump. Presented by JBTV, a popular Chicago-based music TV show, and sponsored by Threadless, a renown American T-shirt company, the free concert series will showcase 42 top Chicago artists performing over four days and nights in the heart of downtown Austin. JBTV will be there to capture every moment, documenting the concert series for a 60-minute special to air on NBC Chicago Nonstop. The 2011 SXCHI lineup SO FAR features Smoking Popes, Scott Lucas & the Married Men, Empires, Bob Nanna, Ha Ha Tonka, The Frantic, Death on Two Wheels, The Fireship, David Costa, The Fold, My Gold Mask, The Scissors, Heart Set Self-Destruct, The Lifeline, Mia LeBlon, I Fight Dragons, The Alaya Conscious, Matter of Fact, The Noise FM, Kirkland, Tommy and the High Pilots, Famous Like You, The Felix Culpa, Yourself and the Air, The Aesthetic, Arma, The Right Now, Lehnen, Houses, HeyPenny, Par Avion, Blah Blah Blah, Oceans Over Airplanes, Without a Face, In Tall Buildings, Small Sins, United Federation of Planets, Ronny Robinson, How Far to Austin, Suns, True Womanhood and Light Pollution. Stay posted for further announcements on more performances to be added onto the already impressive lineup. The shows in the SXCHI festival are free, open to the public, and restricted to ages 21+. 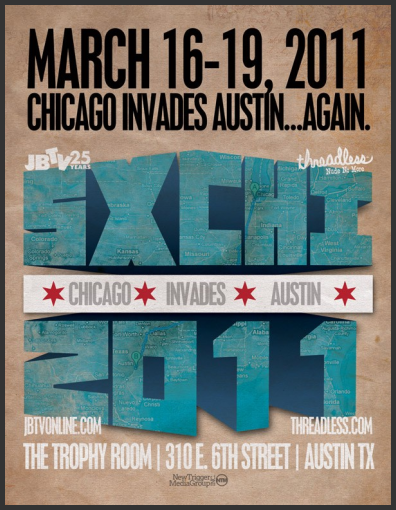 The complete SXCHI daily schedule, venue and general event information, will be posted soon on JBTVonline.com.